The eight district of Vienna is funny - it is densely populated and among the busiest and most central districts starting just behind the Rathaus city hall. Yet it is also one of the least touristy district in the central parts of Vienna. One of the few things that do attract some touristy attention is the Piaristenkirche Church "Maria Treu". The church′s characteristic twin towers with pointy spires are clearly visible from many spots in Vienna and make a good landmark - almost as good as those of the Votivkirche in the neighbouring ninth district. 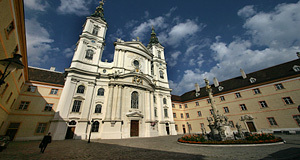 The church was designed by Lukas von Hildebrandt and is considered his masterpiece on the list of his sacral buildings. Together with the Peterskirche in the first district, the Piaristenkirche is his answer to the Karlskirche, which was designed by his lifelong rival Fischer von Erlach. The "Piarists" are an order that was founded in 1597 by Saint Joseph of Calasanz. Its objective was - besides many monkish ideals and principles - to provide schooling for the children of the poor. The Piarists opened an abbey in Vienna after the Second Turkish Siege in the late 17th century. From the beginning, the designs for the church were done by Vienna′s star architect Lukas von Hildebrandt. He provided detailed plans and drawings before 1700, but the actual construction did not start until 1716. Four years later, the basic structure of the church was set up. Due to financial difficulties, the building was not finished and the altars were only provisory ones. Gradually and over the course of years, the church was finished piece by piece. Typical for a design by Lukas von Hildebrandt, one cannot see the resulting fragments, bits and pieces at all - the church looks playful and light with many round shapes (which is characteristic for Hildebrandt′s late, Italianesque Baroque); but homogenous altogether. The person in charge with supervising the construction was an employee at Hildebrandt′s workshop, Franz Jäggl. He got into an argument with the Piarist monks and quit his job in the 1730ies. This and the continuing financial difficulties delayed the construction even further. Only in 1751, the façade and one of the two towers were finished. The following year, the cupola was finished - likely to be the only significant piece at the Piaristenkirche that differs from Hildebrandt′s designs. The altar paitning was probably made by the locally active artist Josef Herzzusammen. According to legend, Herzzusammen fell ill with the plague and swore an oath to go on a pilgrimage to Rome, study paintings there and create a decent altar piece for the Piaristenkirche. Whereas it is unclear to what extent this legend is true, there is evidence that bits and pieces of the interiors were added over time. The frescoes were made by Anton Maulbertsch around 1750, the furniture was added until the end of the 18th century. The most recent addition was the massive organ, built until 1858. It is said that Franz Liszt and Anton Bruckner have played it. The piazza in front of the Piaristenkirche as a distinctly Italianesque feeling. The two towers if the church were by the way not part of Hildebrandt′s design - they were added later and are based on a sketch by Salomon Kleiner. The central eye-catcher on the square is a plague column dedicated to the Immaculate Mary. It was built in 1713. Attractions nearby include the Theater in der Josefstadt; the Rathaus and Vienna University; the Votivkirche and the Altes AKH. The real attraction of the Josefstadt, however, is the distinctly non-touristy flair, with small cafes, bars and specialist shops in the side-streets.